Times have changed and today’s waterfront property owner wants beauty and longevity as well as strength and functionally coupled with sound engineering and a proven reputation for quality when it is time to invest in a new dock system. 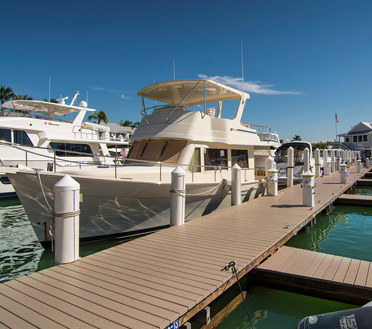 Florida Marine understands the connection to the water and the emotional needs and desires of the user – it embodies a product and a feeling. As an extension of a property into the water. North Captiva Island Club Marina. The Scout nestled conformably within her covered home North Captiva Island. Exceptional new fuel dock and amenities for South Seas Plantation. Small boat marina facility for South Seas Plantation, Captiva Island. A dedicated dock rebuild on private Burgess Island with a the chair at docks end.